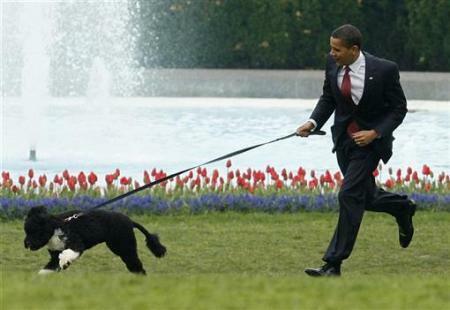 Team Obama likes to provide entertainment so let’s join in the fun. Everyone in the United States who is not comatose knows by now of the Super Obama PAC (SOP) Priorities USA Action campaign advertisement claiming that Bain Capital shut down a steel plant and that one woman died of cancer. Both indeed happened. Not only that, but many other women, men, and even children also died of cancer. Why have they gone so easy on Governor Romney? Are they chickens, preparing to be served at Chick-Fil-A? The head of the SOP defended the ad. “What fact in that ad is wrong?” Burton said as he pushed back on a fairly feisty Wolf Blitzer during an interview on the CNN set. “You’re saying there’s an impression,” Burton said, as Blitzer said the ad implies Mitt Romney had a connection to the death of the man in the ad, Joe Soptic, who talks in the spot about losing his job at a Bain Capital-owned steel company when the plant was shut, and how he lost his health insurance and his wife lost hers, and she got sick a short time later and died within 22 days of a cancer diagnosis. “I just don’t think that’s true, and we would never make that case,” Burton said. As we reported yesterday, she died in 2006, five years after he lost his job. CNN later reported she had her own health insurance from her job after Soptic was fired, which had been her primary insurance and which she lost after she got injured prior to her cancer diagnosis. Gosh! Well, some of it must be true. Here’s the current Romney Campaign ad in response. Unlike the SOP ad, it does not hide behind a surrogate and is pretty good. There are ample bases in Government data and projections for this claim. According to the Center for Disease Control, there were 2,437,163 deaths in the United States during 2009. 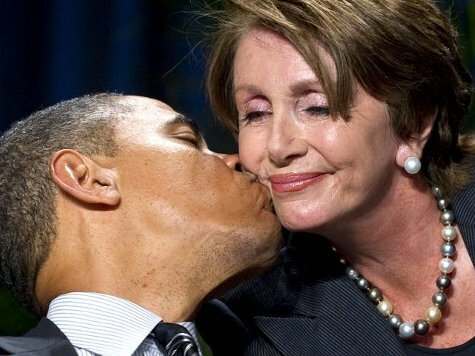 Assuming a four year second term in office for President Obama, no change in the death rate and a constant population, it is politically mathematically correct to project 9,748,652 deaths between January of 2013 and January of 2017 — many of them Blacks, Hispanics and Native Americans (some distantly related to Squaw Warren); disgraceful. According to the same source, however, the estimate for 2010 is for 2,465,936 deaths. Assuming that the CDC estimate is correct and that there will be no significant change between January 2013 and January 2017, there will be at least 9,863,744 deaths — 115,092 more even than suggested above. Truthful? Of course; it’s from the Federal Government. Causation? Only in the sense of Post hoc ergo propter hoc, but so what? That’s the only causation involved in the SOP cancer ad. Ethical? Apparently Team Obama thinks so. Stupid? Team Obama seems to think it’s a clever way to proceed; having been regarded as masterful campaigners during the last campaign, they must be correct. How about another? 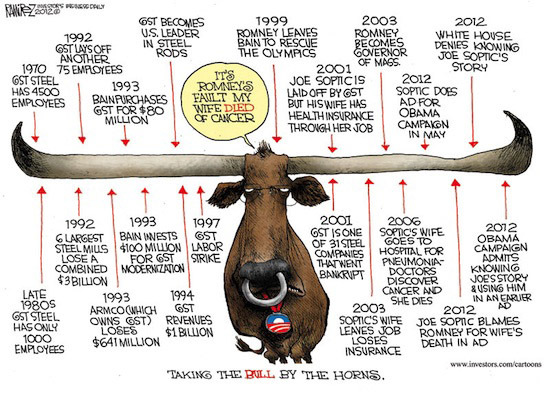 Senator Reid has claimed that Governor Romney went ten years without paying taxes. 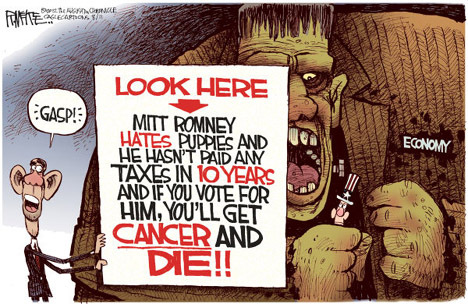 The Obama Campaign has climbed on board the tax train by asking at what rate Governor Romney paid taxes, if at all. It is highly probable if not certain that young Master Romney got an early start on tax evasion avoidance and that for at least a decade he paid no Federal taxes. During that decade or more he most likely never filed, saw or even thought about a tax return. It would be very surprising were it otherwise from his birth and until ten years thereafter or even later. Indeed, as a young child he probably had no cogent plans for United States domestic or foreign policy. 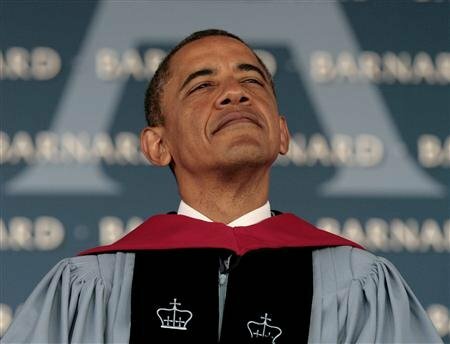 He was then neither sufficiently experienced nor knowledgeable of the world to become our President and therefore (unlike President Obama) is not now. 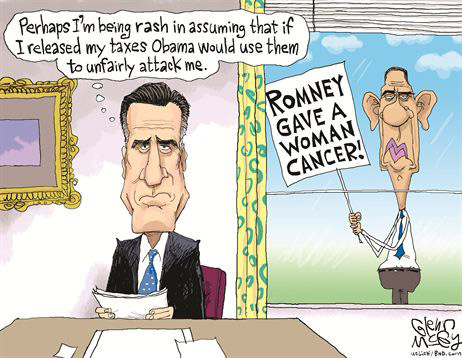 How about a Romney Campaign ad questioning the rate at which Barack Obama paid Federal taxes over a twenty year period? With appropriate Indonesian music in the background, a photo of young Master Obama with the caption “Taxes? What are taxes? Do they taste like puppies?” could appear. Perhaps a cute but frightened pup on a leash could be trying to scurry away from a flaming barbecue pit in the foreground as an Islamic decapitation religious ceremony takes place in the background. That should be fun to play with. How about one featuring President Obama in similar fashion hitting a small White girl trying to run a lemonade stand and screaming “You didn’t grow those lemons — somebody else did. I’m The Government so it’s all mine! Give it to Me!” His very own war on females and youth. More? It’s all silliness and the possibilities are incalculable. None of them would have much effect on who wins the election, but politics is a creative effort and some might be fun to create. Besides, we are all fun-loving fruitcakes. Did no one ever point out to you that “It can’t happen here”?